Eczema (commonly known as Atopic Dermatitis) is an inherited, chronic inflammatory skin condition that usually appears in early childhood where it occurs in around 1 in 5 children under 2 years of age. It can also occur in older children and adults but usually improves with age. Although eczema can be effectively treated and managed, no cures are currently available. 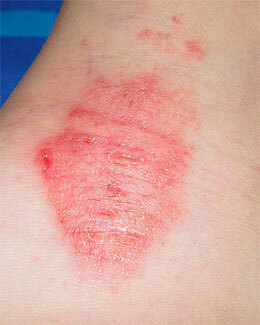 In Atopic dermatitis (eczema), Patches of skin become red, scaly and itchy. Sometimes, tiny blisters containing clear fluid can form and the affected areas of skin can weep. Weeping is a sign that the dermatitis has become infected. lesions (sores) that may become infected by bacteria or viruses. Our suggestion for the best natural treatment for Eczema/ Atopic dermatitis is, with PSOEASY Hypo-allergenic Soap Bar to clean the area ,PSOEASY Mild Natural Oil and PsoEasy Active Cream to treat the affected area. For children with Atopic Dermatitis/ Eczema on the face we suggest to use a very small amount of PsoEasy Active Cream on the area where the jaw meets the neck (where the skin is thicker) for a day or two before gradually applying to the rest of the face. 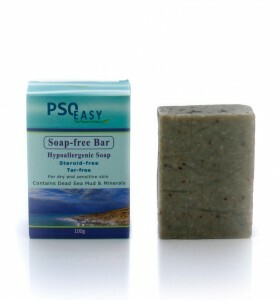 PSOEASY Hypo-allergenic Soap Bar is designed to relieve, alleviate and prevent numerous skin conditions caused by climate and environmental factors such as: Acne, hormonal spots, Seborrhoea, Psoriasis, Eczema and others. PSOEASY Soap Bar contains a blend of vegetal extracts, algae and Dead Sea Silt, and is distinguished by its ability to penetrate skin pores, cleanse, and purify the skin thoroughly. The Soap Bar also contains a moist layer for renewing skin cells and restoring the skin’s external appearance. PSOEASY Soap Bar is handmade using traditional methods that includes a slow, 4 week sun-drying process, which enhances the soap’s active ingredients and its effectiveness on the skin. 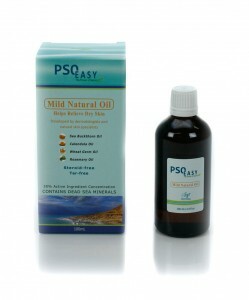 PSOEASY Mild Natural Oil is designed to relieve dry skin and improve skin hydration and softness levels. The oil is made from a unique combination of plant extracts and Dead Sea minerals, which have been shown to be effective in the treatment of psoriasis, eczema and seborrhoea. Mild Natural Oil contains natural ingredients including: Sea Buckthorn Oil, Tea Tree Oil, Calendula Oil, Wheat Germ Oil and Grape Seed Oil and Dead Sea minerals – well known for their skin purifying and healing properties. 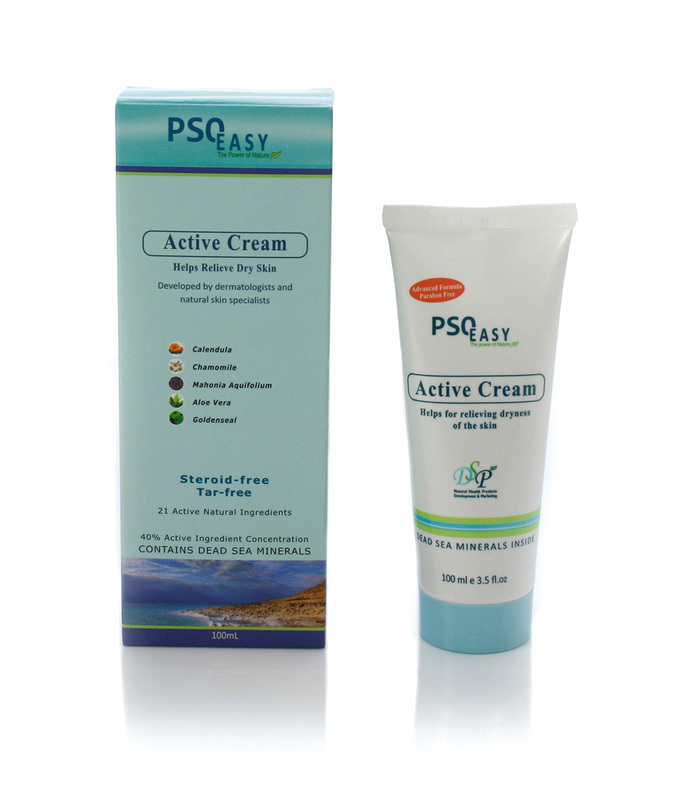 PsoEasy Active Cream is designed to treat and relieve dryness, redness and flaking of the skin. It is made from a unique natural formula, which includes Dead Sea minerals and plant extracts. The cream is an excellent source of nourishment for any skin type, however, it is especially effective at treating symptoms caused by inflammatory skin disorders. Based on years of research and development, the PsoEasy natural and active formula is effective in relieving symptoms caused by psoriasis, atopic dermatitis, eczema and seborrhoea. Active Cream’s formula contains 21 natural ingredients including Calendula, Tea tree oil and Mahonia aquifolium. Active Cream is simple to use, easily absorbed by the skin, does not stain clothes and leaves a pleasant scent.